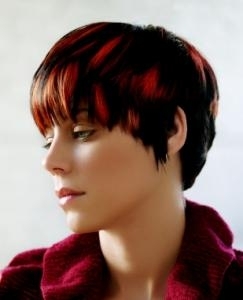 Brunette Hairstyles with Red Highlights. 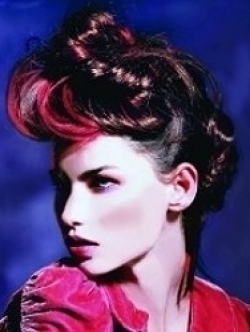 Brunette hairstyles tend to be provocative and alluring, helping to create a powerful presence. However with the help of well chosen highlights brunette hairstyles can be spiced up even more, especially when contrasting colors are chosen. Red highlights have a powerful effect on brunette shades adding a strong and powerful vibe that instantly attracts attention, making any hairstyle strand out from the crowd. Darkening a hair color can be a good way to create a more interesting hairstyle, especially if the shades chosen matches one's skin tone. The decision to go brunette is one of the easiest ones to make since you are not restricted a limited palette of tones. While for many women going blonde or red can be a tricky decision, the palette hair color is much more diversified in the case of of brunette shades, making it possible for every women to fulfill her desires when it comes to hair coloring. However, to ensure that your new look doesn't get unnoticed it might necessary to go a step further in customizing your look. 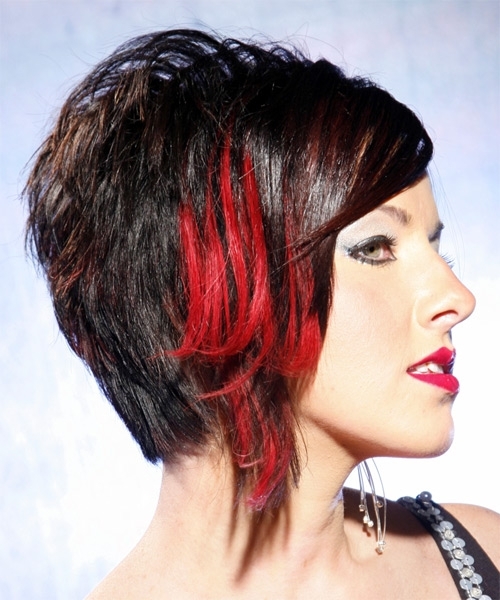 Red highlights are an excellent way to start especially when you want to create a powerful impression by playing with contrasts when it comes to color. 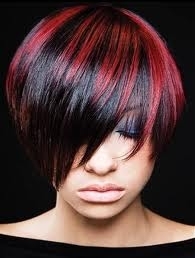 Strong reddish tones are definitely not suitable for those who are not comfortable being in the center of attention because they help create edgy hairstyles that inevitably get noticed and, depending on the way you style of the highlights might even create controversy. So before opting for red highlights, make sure that you are comfortable with bold hairstyles to minimize the chances of ending up regretting the choice you made. The next step is deciding on the highlighting technique you are going to use to create the desired effect. 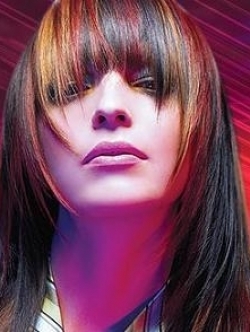 Depending on the change you are aiming to get, you might turn to different ways of adding highlights. 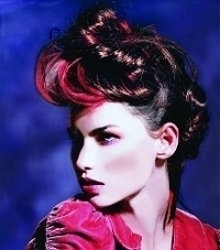 You might have to turn to a professional hair stylists if you want a more complex hairstyle to ensure the best results. However, if the change you want is not a very complicated one you can try to do it yourself especially if you have experience with hair coloring. One of the best examples when you can do the job yourself is when adding color to a single thick strand of hair as you probably won't need any assistance to complete the steps of the required for the result you are trying to get. On the other hand if you want to add thin highlights with the method of foiling in which each hair strand must be dealt with individually you will most likely need assistance to get the job done well either from a friend to help you deal with the section you can't reach well by yourself or from a professional to make sure that the job gets done with superior results. Turning to a specialist is also a good idea when you want to get a unique color and you have to mix different hair dyes to get it, because you will most likely have a difficult time getting it by yourself. 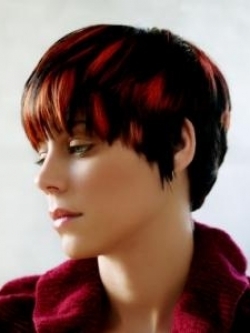 Although typically in the case of red highlights matching the color with the skin tone is not one of the main concerns, you might want to consider this aspect as well as especially if you want this look to be part of your signature style. If you pay attention to small details you can easily get a hairstyle that meets all your expectations. A natural shade that blends well with your brunette color like dark plum or red tones with a brownish hue might be just what you need for an instant style change that will make you look stylish and modern. 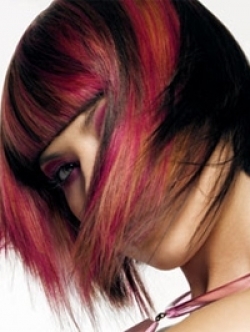 It is recommended to first try a subtle change, if you are experimenting with red highlights because fiery red highlights might prove to be too much to handle all at once when you are not used to with wild color experiments. In time you, as you get used to changes you will gain more courage to try out a great variety of highlights colors because you will be able what are the hues that compliment you the most. It is also important to learn how to take care of your highlights to be able to enjoy your new look for as much as possible. It's good to now that regardless of the shade chosen red dye tends to fade off faster than other types of dyes to due to its distinct chemical composition. Heat and UV rays tend to be the biggest enemies of a red locks so one of the main things you can do is to protect your locks from these factors as much as possible. A color enhancing shampoo is also a good idea to keep the wonderful color of your locks for a longer period of time.